Eating in Charleston, SC, is an event itself! Top-rated restaurants and chefs abound in this city. But what’s unique is that you can get amazing food even in a casual dining atmosphere. Check out Fleet Landing Restaurant & Bar and Hominy Grill. You won’t be disappointed! Within walking distance to River Front Park is Fleet Landing Restaurant & Bar. It’s the only restaurant in Charleston actually on the waterfront. Housed in a 1940’s retired naval building, the restaurant has a wrap-around porch with a great view. Their appetizers are equal to what you might find in a 5-star restaurant. 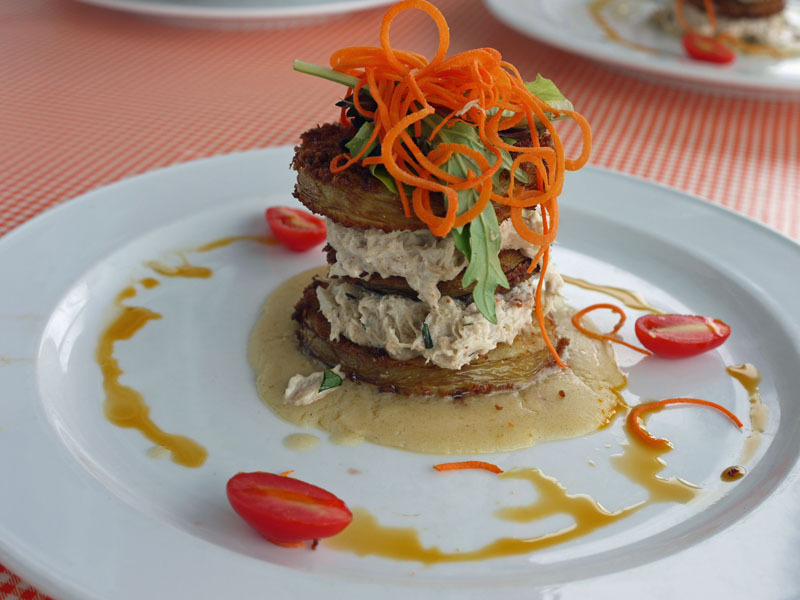 My favorite is the Fried Green Tomato Stack (perfectly fried sliced green tomatoes layered with blue crab and creamy shellfish sauce). Their She Crab Soup with blue crab and sherry is also a great starter. For an entrée try the Pan Seared Tilapia or Grilled Local Swordfish. And save room for dessert. If you’re a chocolate lover you’ll want to order the Fleet Landing Chocolate Torte with cinnamon pecan crust served with whipped cream and chocolate sauce. Housed in a former barber shop, this restaurant is popular for its great Southern breakfast, lunch, and dinner. We stopped in for dinner on a Saturday evening, and although it doesn’t look like the type of place where you might need reservations, do make them, as it’s a favorite spot for locals and tourists alike. Described as “food just like Grandma’s,” I’d definitely say this Grandma has some secret gourmet touches! Everything is made from fresh, locally raised ingredients and is definitely upscale from your typical Southern cooking. In fact, Chef/proprietor Robert Stehling won the 2008 James Beard Award for Best Chef in the Southeast. This entry was posted in Food and Wine, Restaurant reviews, South Carolina and tagged Charleston, Fleet Landing, food, Hominy Grill. Bookmark the permalink.